I LOVE Autumn. It is my favorite season, with Winter being a close second. There's just something about cold weather that makes me feel so snuggly and happy. I love everything about it, the colors, the fashion, the food, the hot drinks. And Halloween! Nothing gets me in the mood for fall like the movie Hocus Pocus! So this weekend I got into the fall spirit and put together a couple of new macaron flavors to celebrate the season! Pumpkin Spice and Apple Spice! I know everyone goes ga-ga over pumpkin when September rolls around (thank you for the Pumpkin Spice latte, Starbucks), but I don't want to forget the amazing apple! I love apples, apple cider, and APPLE BUTTER! Delicious! These flavors of macarons are now available for purchase in my Etsy Shop! When coming up for the fillings for my various macarons, I often use Italian Meringue (sometimes called Italian Buttercream, but there is no butter in this recipe). For both of these new flavors, I mixed in Italian meringue to give it texture and sweetness. I find that this recipe is fairly simple, and makes a cream/meringue that you will not be able to stop sampling. I think I went through at least five spoons in the process of making my last batch because I couldn't stop taking taster bites. Heat the sugar and water mixture, make sure you brush the pan with water to make sure there are no dry sugar crystals. When the syrup reaches 220, start beating your egg whites. Once the syrup reaches 240, your egg whites should be at stiff peak stage. CAREFULLY pour the syrup into the egg whites, as they are still beating. I can not stress enough how careful you need to be with this syrup. It is lava! Pour all of the syrup in and keep beating until the mixing bowl reaches room temperature. I'd guess this takes about eight minutes, but I'm terrible at time estimation (I know, terrible affliction for a baker, but that's why I use my trusty phone timer when things are in the oven), so just mix until the bowl is room temp and you're good. The finished product is going to be thick and glossy and delicious and amazing and addicting. And and and. You can use it to frost a cake, make meringue cookies, top a pie, or make macaron fillings! If your meringue starts to separate after a couple of days, just throw it back into the mixing bowl and mix it until it becomes fluffy again. All good! J'adore Fridays and j'adore these things! Chocolate peanut butter cupcakes are my FAVORITE cupcakes ever. My best friend, Kristin, can attest to that. She's made them for me a few times, and she's a golden goddess. I love this recipe from Annie's Eats and the way she does the frosting to look like a peanut butter cookie, is SO CUTE! 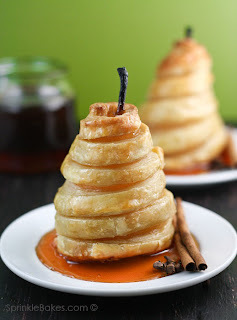 I super love poached pears, and these honey poached pears in puff pastry from Sprinkle Bakes look amazing! I'm definitely going to have to try this one! 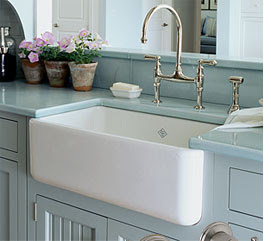 I LOVE FARMHOUSE SINKS! When I have my dream house, some day in the distant future, my kitchen will have a gigantor farmhouse sink and I will die of happy. I love this one featured on Pink Wallpaper. It's beautimus and the turquoise kitchen makes my heart smile. Happy Friday, everyone! I hope you all have lovely weekends! If you try either of those recipes, feel free to comment and let me know how it went!! I've had these blank greeting cards in my hallway Closet O' Random Stuff for quite some time and I finally decided to do something with them. Every once in a while I get really in the mood to do stuff with ink pens, and I thought it would be fun to draw on these little cards with some fun pens. There is really nothing like a good pen. So smooth and inky, it's incredibly satisfying. I got these colorful pens that I've really been enjoying lately. They are pretty colors, and the case folds back to make a little pen stand, which I enjoy immensely. When writing or drawing with black ink, my current favorite pen is the Pilot Precise V7 or V5, depending on how fine a line I want. So, I used all my fun, fancy pens to draw a couple of silly greeting cards. I have only done these two so far, but I'd like to do some more, and I have plenty of blank cards left. It's kind of a relaxing project. I worked on one card while hanging out in my boyfriend's office, keeping him company while he was working. The other I did while hanging out with my mom in her glass studio. Fun things, fun things! I may put some handmade cards up in the Etsy shop someday soon! As I mentioned the other day, I've been feeling particularly crafty. Sidebar: Whenever I say "crafty" I think of the Beastie Boys song. "She's crafty! And she's just my type!" (RIP MCA). Anyhoodle, back to my post! 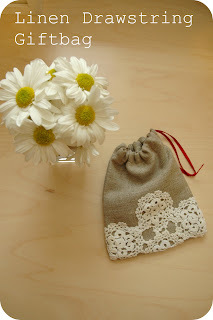 I'm going to try to post something crafty every Tuesday... we'll see how it goes! So, my downstairs guest bathroom has been pretty blah since I moved in over a year ago. (Jeez, get on it, Aubrey.) I have a hard time deciding on color schemes and decorations and stuff like that. Recently I had a good friend of mine, Haya from The Calculated Kitchen, come stay with me for a few days (which was so much fun). There's nothing to inspire home improvement projects like knowing you will soon have a house guest. One of the ideas I wanted to actually do, was make a sign for above the toilet that says "Have a Seat". Silly, I know, but I thought it was cute. I had gotten some little canvases on sale at Michaels, and thought I should put one of them to use. I started with my blank canvas and some pretty paper (also from Michaels). I then covered my canvas with the chosen paper. Then I got to painting! I'm sort of a turquoise fiend, so the colors I ended up on for my bathroom are turquoise and orange. I thought the turquoise paint looked good on the paper I chose. The only problem was, the letters weren't thick enough to really stand out against that busy background, so I did have to outline them all in heavy black ink. Once the lettering was all done, I added a small paper flower to the corner and woo! Finished product! It's now hanging in my bathroom, looking pretty, and the paper flower matches the flowers I made for the vase next to the sink. Excellent. First off, let me start by saying I've never been a huge caramel fan. It's usually over-the-top sweet for me and hurts my teeth. Yet everyone calls me crazy for not liking it. I want to like it, I really do. It LOOKS really great. Especially when people put salt on it. I'm a huge sucker for the salty/sweet combo. So when I ran across this recipe at Flour it Devour it, I thought it might be time for me to attempt caramels. I like that the recipe does not use corn syrup, but rather honey. I LOVE love honey, and thought the flavor would really lend itself to caramel. Also, there's vanilla. Double yum. So I went about trying out this recipe, with just very slight modifications. Thank you instagram for making my crappy photography look any kind of acceptable. Hopefully. So I started with raw honey and organic cane sugar. I used vanilla sugar that I made (it's easy, just chop up some vanilla bean, scrape it into the sugar, then throw it all into an air-tight canister, scraped out beans included, and the flavor infuses into the sugar. SUPER good). Pour the honey over the sugar and let it melt on a medium to low-ish heat. I also scraped an extra half of a vanilla bean into the mix, because hey, I love vanilla. Do not stir the sugar! Stirring may cause it to crystallize. If you need to do something because you just can't stand it, swirl around the pan a little, but please refrain from stirring. I know it's difficult. While the sugar is melting in the honey, heat up the cream, bringing it to a simmer. When the sugar is melted, and it's a beautiful golden brown color, add in the pieces of butter and whisk until it's all melted in and smooth. Once the mixture is smooth, slowly add in the heated cream and whisk together. The mixture will foam up a lot, so be careful. Let the mixture cook until it reaches 248°F. When the caramel reaches 248°F, pour it into a pan that has been lined with parchment paper. I used a 13x9 quarter sheet pan. Once it's cooled a bit (10-15 minutes), sprinkle the sea salt over the pan. After the caramel has cooled to stiffness, cut it into whatever size or shapes you like. I cut mine into pieces about an inch and a half long, and half an inch wide, then wrapped them in parchment paper. Viola! Delicious, creamy caramels with tones of honey and vanilla and a hint of salt. YUM! Lately I have been in a super crafty mood. Like, super crafty. Crafts and I have had an interesting relationship throughout my life. Growing up, my mom was (and actually still is) the queen of arts and crafts. THE QUEEN. Which was pretty awesome as a kid. There were always fun projects to do and mom would jump at the chance to do something artsy with us. In my college years, I began to have a resentment towards crafts and craft mess. I started feeling overwhelmed by the disorganized nature of crafting and all the bits and pieces that went along with it. It probably doesn't have to be that way, but in our house it was. Art materials basically exploded all over my parents house when I was little, and has stayed that way to this day. Because I had no idea how to organize stuff like that, I began to just avoid it. UNTIL NOW! I am not sure what's happened, but the crafting bug has bitten me once again and I find myself wanting to buy yarn, fun paper, paints, and all those wonky edge scissors. I kind of blame Pinterest. In any case, this brings me to my point. I'd like to perhaps add a section of my shop called Tartlet: Out of the Kitchen, in which I sell items for the home, beauty, paper things, etc. Just stuff, that isn't edible. What do you think? Is this me not being focused? Am I too ADHD to stick to one business idea and go with it? I guess we'll find out! 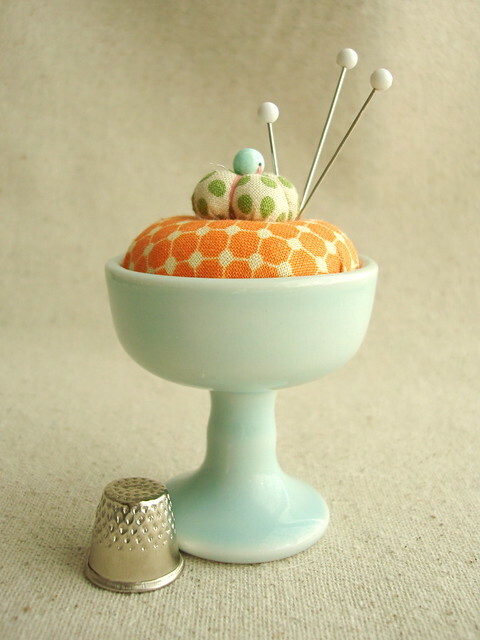 Adorable pin cushion. SERIOUS ADORABLE! And more!! I also kind of want to do a line of one-off, hand drawn greeting cards. I have already done a couple, but don't want to put them up until I have some more done. I've also been fooling around in the Tartlet kitchen and have come up with some more goodness, including salted caramels, and chocolate bark. I will be putting these items up soon!